MDN has switched to Persona, a safe and simple way to sign in with just your e-mail address. Learn more about why Mozilla is using Persona. Returning members: sign in with Persona and you'll be connected to your MDN profile (all your information is still here). New members: sign in with Persona first, then you'll be able to set up your new MDN profile. Are you ready to make browsing better? Get add-on development guidance in a top-notch collection of tutorials, articles, and more. The official documentation on APIs and languages. What you need, when you need it, to create your masterpiece. Complete documentation for developing extensions for Mozilla applications. Start-to-finish success stories. 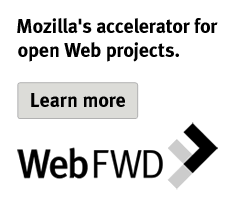 See how add-on developers made magic with Mozilla. or the Adobe Flash Player. Alternatively, you may use the video download links provided. 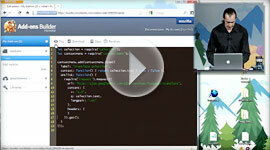 Watch Myk Melez create an Add-on in 5 minutes using the new Add-on Builder! Use Add-on Builder to quickly and easily develop an extension for Firefox using common web technologies. Auto-generate add-on packaging by entering basic info and picking UI parts. Get working without setup. Check your add-on for common problems and errors. Open to anyone, not just add-ons hosted here. Tweets from the Add-ons developer community.